Thao Suranari is the style (manner of address) of Lady Mo, also known as Yamo (1771–1852), who was the wife of the deputy governor of Nakhon Ratchasima, the stronghold for Siamese control over its Laotian vassals, at the time of the Vientiane King Anouvong's attack on Korat in 1826. Anuvong's forces seized the town and evacuated the town's inhabitants. 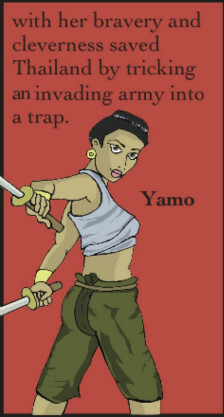 Lady Mo is credited as the leader who saved the city by harassing the invading force. Varying stories describe her plot of getting the invading soldiers drunk, or leading a rebellion of captured prisoners on the route back to Vientiane. Consequently Lao troops were dispersed, and forced to retreat quickly. Eventually, Bangkok sent troops led by General Sing Singhaseni who defeated Anuvong with the total destruction of Vientiane. The style Thao Suranari, (or Lady Suranari – The Brave Lady) was awarded her by King Rama III in recognition of her bravery.